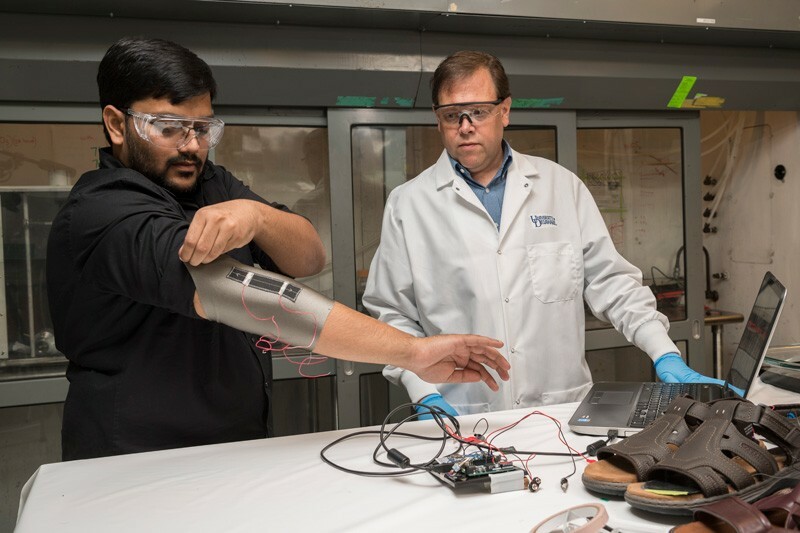 A team of engineers at the University of Delaware is developing next-generation smart textiles by creating flexible carbon nanotube composite coatings on a wide range of fibers, including cotton, nylon and wool. Their discovery is reported in the journal ACS Sensors where they demonstrate the ability to measure an exceptionally wide range of pressure – from the light touch of a fingertip to being driven over by a forklift. Fabric coated with this sensing technology could be used in future “smart garments” where the sensors are slipped into the soles of shoes or stitched into clothing for detecting human motion. Erik Thostenson, an associate professor in the Departments of Mechanical Engineering and Materials Science and Engineering, demonstrates how a sensor could be placed inside a shoe to measure foot pressure. Now, researchers can add these sensors to fabric in a way that is superior to current methods for making smart textiles. Existing techniques, such as plating fibers with metal or knitting fiber and metal strands together, can decrease the comfort and durability of fabrics, said Thostenson, who directs UD’s Multifunctional Composites Laboratory. The nanocomposite coating developed by Thostenson’s group is flexible and pleasant to the touch and has been tested on a range of natural and synthetic fibers, including Kevlar, wool, nylon, Spandex and polyester. The coatings are just 250 to 750 nanometers thick — about 0.25 to 0.75 percent as thick as a piece of paper — and would only add about a gram of weight to a typical shoe or garment. What’s more, the materials used to make the sensor coating are inexpensive and relatively eco-friendly, since they can be processed at room temperature with water as a solvent. One potential application of the sensor-coated fabric is to measure forces on people’s feet as they walk. This data could help clinicians assess imbalances after injury or help to prevent injury in athletes. Specifically, Thostenson’s research group is collaborating with Jill Higginson, professor of mechanical engineering and director of the Neuromuscular Biomechanics Lab at UD, and her group as part of a pilot project funded by Delaware INBRE. Their goal is to see how these sensors, when embedded in footwear, compare to biomechanical lab techniques such as instrumented treadmills and motion capture. “One of our ideas is that we could utilize these novel textiles outside of a laboratory setting — walking down the street, at home, wherever,” said Thostenson. Interdisciplinary collaboration is essential for the development of future applications, and at UD, engineers have a unique opportunity to work with faculty and students from the College of Health Sciences on UD’s Science, Technology and Advanced Research (STAR) Campus.